I never skipped breakfast till now. No reason behind it. I am wondering now, why I never skipped it? I had many times missed my college bus only because of my breakfast. I remember my aunt yelling at me for missing bus and not keeping up with my time. She tried to change me. Finally she changed herself and packed breakfast in a box. Advised me to have it during the long(?) journey to the college. Then, in the crowd among all the other students, I started to have my breakfast in the bus. I didn't feel shy at all. I never worried about others unnecessary annotations and weird look. I know my mind always thinks about eating at correct time. Well, Last week, I visited my aunt's house. She is still yelling, not with me but with her son. She packed breakfast for him and gave it to him. but the box was returned in the evening untouched. I understand, these days kids are not concentrating on food while going to school in the morning even though they are good at eating. The next day, I prepared this milkshake and gave it to him instead of breakfast. Hah... Success...He finished it while tucking his shirt in. Why can't you try this simple breakfast for your kids for instant energy? It is good to you too. 1) Soak almond for overnight/2 hours and remove the skin. Slice the banana into slices. 2) Put almond first in a mixer/blender and blend it for a minute. 3) Add milk and banana slices now and continue blending for another minute or until you don't find any lumps. 4) Add sugar / honey and blend it just enough to mix. 1) Add vanilla ice cream/ice cubes if your prefer. 2) Add a teaspoon or two of cocoa powder for chocolate shake. 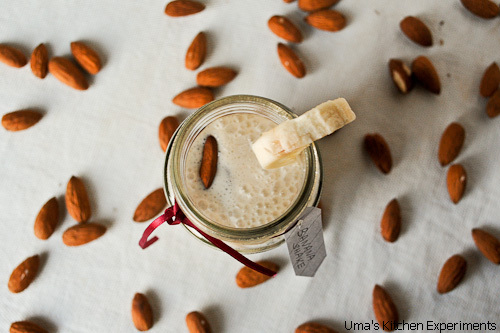 3) You can also prepare this drink instantly without soaking almond. However, it is advised to remove the skins, if you are going to serve for kids to avoid digestion problem. 4) Almonds are sometimes difficult for few people to digest because of an enzyme-inhibiting substance in their brown coating. Soaking or sprouting removes this inhibitor so that the enzymes secreted during digestion can do their job. Uma, this looks so good. I can have this for dessert too. healthy yummy shake. super clicks. Perfect breakfast recipe...sounds so yummy!! Delicious looking pictures.. Great shots. I love your idea of soaking and peeling almonds for the milk shake. Beautiful Blog too. Excellent pics of the milk shake. 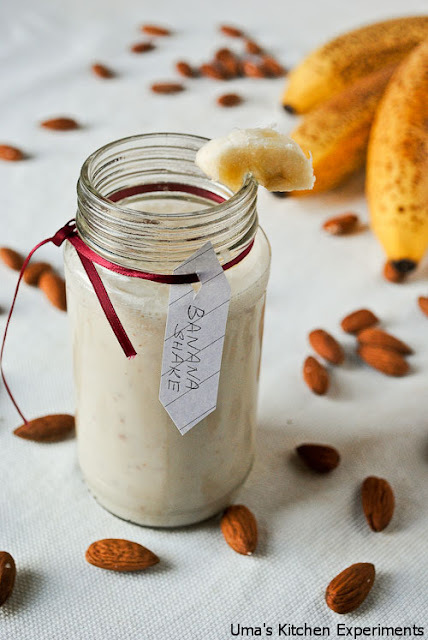 Very nice and healthy shake..
Definitely a healthy and wholesome breakfast option. healthy and refreshing drink. love it. Lovely and delightful drink.. would love to have anytime .. This looks and sounds so delicious.I can have this anytime. @Anu, Thanks Anu. I reply back soon. Thanks for letting me know. 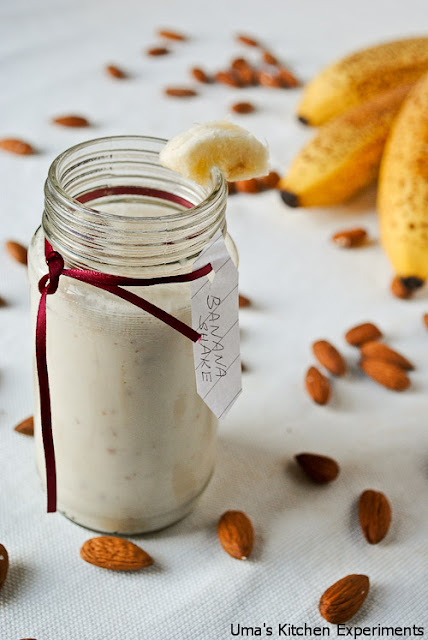 Delicious and healthy shake, nice way to start the day. Super duper healthy shake..perfect for breakfast,Uma!! A very healthy combination and an ideal breakfast option for kids. Yummy and healthy milkshake Uma.